Are you trying to save a little money when it comes to servicing your car in Brewer? Take a look at these great car service and maintenance coupons. Keep your car and wallet happy at the same time! Just print one off and bring it in today! Get a 4-wheel computerized alignment with a printed specification sheet for just $74.95! Plus tax and miscellaneous fees. May not be combined with any other coupon, offer or advertised special. Not applicable on modified vehicles. Prior sales excluded. Toyota & Scion only. If it is time for new tires, take advantage of this special offer to buy three tires and get the fourth for only $1! This offer comes with a tire price guarantee, a free 2-year road hazard warranty, and lifetime periodic rotations. Installation at Downeast Toyota required. Some restrictions apply. Please contact a Service Advisor for details. Offer valid on select brands. OEM, OEA and WIN replacement tires only. Three tires at regular price, fourth tire for one dollar. The fourth tire must be of equal or lesser value. Excludes mounting and balancing, sales tax, shop supplies, tire disposal, and other applicable taxes. Excludes previous purchases. Toyota vehicles only. Offer available from 4/1/2019 to 4/30/2019. Tax and material / environmental fee extra. Any Toyota or Scion with synthetic oil. Most Toyotas included in above pricing. Some models require additional service/parts at extra expense. If a discount applies, it will be taken off the regular posted price. Must present coupon when the order is written. Prior sales excluded. Cannot be combined with any other coupon, offer or advertised special. Valid only at Downeast Toyota. Need a new battery? Take advantage of our everyday low price. Toyota & Scion only. Hybrid vehicles extra. 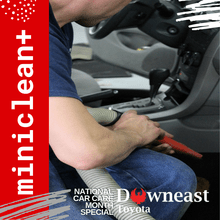 Get your tires rotated at our everyday low price of $16.95 or FREE if you purchased your tires at Downeast Toyota!